A month after an investigation found dangerous levels of asbestos fibers in some of Philadelphia's most rundown elementary schools, the School District has begun cleaning up seven of them. The schools were among 19 where Inquirer and Daily News reporters, as part of the "Toxic City" investigation, enlisted staffers to collect wipe samples in classrooms, gymnasiums, and busy hallways to test for asbestos fibers, mold spores, and lead dust from deteriorating paint. The district chose to clean schools where the newspapers' tests revealed at least 50,000 asbestos fibers per square centimeter in settled dust. In five of the seven schools, the lab results revealed millions of the cancer-causing fibers. The seven schools are J. Hampton Moore, A.S. Jenks, Henry A. Brown, Lewis C. Cassidy, George W. Nebinger, Thomas Mifflin, and Olney Elementary. The U.S. Environmental Protection Agency says there is no safe level of exposure to asbestos, which can be found in nearly all of the pre-1980 schools. When inhaled over time, the microscopic fibers can cause cancer and debilitating lung disease. Experts say 100,000 fibers per square centimeter or higher in surface dust is cause for alarm. "We have been working with the Health Department Air Management Services and the EPA to identify a response action to the seven schools that were in your article that showed elevated levels of asbestos in the dust," said Francine Locke, the district's environmental director. The plan involves cleaning up rogue fibers on surfaces using wet-wiping and vacuums with HEPA (high-efficiency particulate air) filters, and making necessary repairs, Locke said. In interviews earlier this week, School Superintendent William R. Hite Jr. and his top administrators outlined several other steps they have or will take to clean buildings and make them safe, such as installing humidity sensors at 30 schools to detect mold early. The district said it will demolish its worst school, Cassidy, and replace it with a new building. Hite said he is pushing his staff to solve environmental problems that they've long grappled with. After the newspapers' three-part series was published in May, lawmakers, parents and teachers rallied, demanding classrooms free of environmental hazards. The investigation also found dangerous levels of lead dust on classroom floors, including rooms for children with special needs. The toxic metal, even in low doses, can cause learning disabilities and behavioral problems. The newspapers detailed the case of 6-year-old Dean Pagan, a first grader who was severely poisoned and hospitalized in November after eating lead paint chips that fell from the ceiling in his classroom at Watson Comly Elementary in Northeast Philadelphia. Dean's case brought to light a gap in the city's safety net to protect kids from lead: While it's illegal in Philadelphia for landlords to rent homes with damaged lead paint to families with children under 7, no such safeguard applies to city schools. "It should not be accepted," said Councilman Mark Squilla. On Wednesday, Squilla and five City Council members introduced legislation aimed in part at closing that gap. 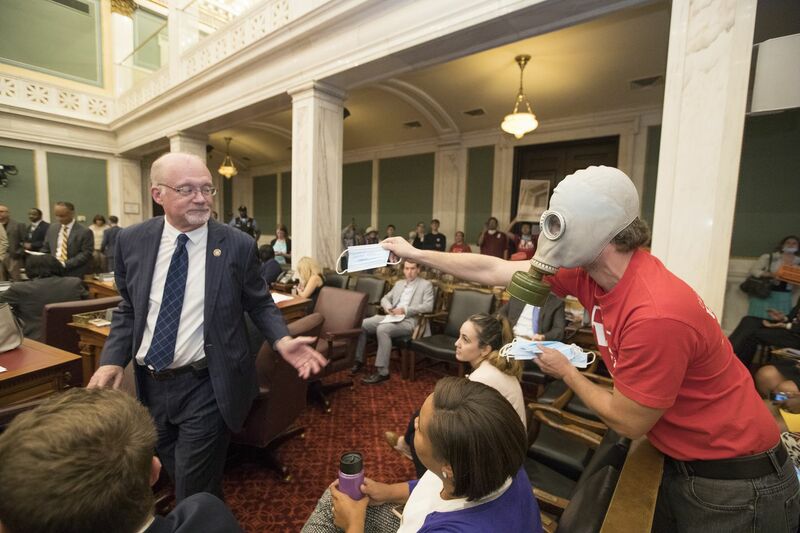 Under Squilla's bill, crafted with help from the Philly Healthy Schools Initiative, public schools must prove that they are "lead free" or "lead safe." Hite on Monday said the district needs more money to renovate its crumbling old schools. In the meantime, the district will do a better job cleaning its buildings, he said. Last week, Hite and Danielle Floyd, the district's chief operating officer, gathered building engineers to acknowledge their hard work but also to challenge them to up their game. "It was a chance, going right into the summer, to say, 'Guys and girls, we got to do better. We just have to do better,' " Floyd recounted. "What I said to them is, `You have to be the building leaders so that principals can be the instruction leaders.' "
Also, the district put its cleaning guidelines in writing for the first time, and distributed them to the staff, she said. Hite said a major cleaning effort has begun and will continue through the summer. "I am inviting people to schools to actually watch" his staff at work, he said. The district last week sought bids to repair damaged lead paint at 40 schools in some of the city's poorest neighborhoods, where children are more likely to be exposed to lead hazards in their homes. District officials said the work will cost a minimum of $7.5 million. The start of summer break comes at a pivotal moment for the School District and city leaders. Council members on Thursday are expected to give final approval to their budget plan, which would provide $605 million in new funding to district schools over five years without raising property taxes. Council has rejected Mayor Kenney's proposed five-year plan that would have provided $700 million to schools but raised taxes. It's unclear whether Kenney will support Council's plan. The budget must be wrapped up by June 30, the day before the city will take back total control of district schools from the state. The newspapers' examination of district records from recent years found flaking and peeling paint in more than 165 aging schools. Those findings were published for the first time in School Checkup, a lookup tool showing detailed reports on hazards inside Philadelphia classrooms, including mold, rodent droppings, and damaged asbestos. On Tuesday, a team of environmental inspectors went to one of the seven schools, Nebinger, in South Philadelphia. They visited a basement classroom where reporters, with help from a staffer, tested an area that months earlier came back at 74,000 asbestos fibers. The team included a district-hired inspector from Vertex, an environmental firm; an inspector with the health department's Asbestos Control Unit; and Jerry Roseman, environmental science director for the Philadelphia Federation of Teachers Health and Welfare Fund. They found damaged asbestos materials from pipe insulation, floor tiles, and exposed mastic. "We spent an hour in that room because there is a lot of asbestos," said Roseman. "It seemed a little surprising to the people with me."